Daniel Bryan Vs. AJ Styles Update, Becky Lynch - Ronda Rousey Backstage Video, Evolution - Twitter - Wrestling Inc.
- As noted, the November 18 WWE Survivor Series pay-per-view from Los Angeles will feature RAW Women's Champion Ronda Rousey vs. SmackDown Women's Champion Becky Lynch in a non-title match. WWE just released this video of Becky interrupting Ronda during Ronda's post-Evolution interview with Charly Caruso. The women of WWE took center stage at WWE Evolution, and the world took notice. The first all-women's pay-per-view in WWE history notched six worldwide trends on Twitter Sunday night, including a two-hour stint at No. 1 worldwide for the event's official hashtag, #WWEEvolution. At the final tally, it was the second most social show in primetime for the evening, ahead of NFL's Sunday Night Football and just behind the final game of the World Series. Congratulations once again to the women of WWE for all their work and achievements on a banner night. 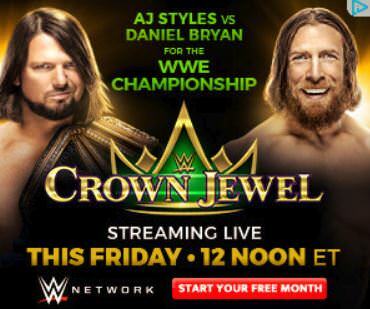 - It's worth noting that WWE has taken out new advertisements to promote Daniel Bryan vs. WWE Champion AJ Styles at Friday's Crown Jewel event in Saudi Arabia, as seen below. We noted earlier how WWE is also advertising that Bryan and AJ will be on tomorrow's SmackDown to promote their match. Bryan's status for Crown Jewel is said to be up in the air still. Bryan and John Cena reportedly informed WWE officials earlier this month that they would not be making the trip to Saudi Arabia, presumably due to the state-sponsored murder of journalist Jamal Khashoggi. WWE confirmed on tonight's RAW that Cena will be replaced by Bobby Lashley in the World Cup tournament at Crown Jewel.